I am married. I have lived with my husband for 13 years. I think we have a wonderful/healthy relationship. One thing I have learned from my marriage is that whenever we spend significant time apart there is always an adjustment period when we come back to living together. Taking this into account I decided to move to Tucson to live and train with Jen without my husband. We needed to iron out the kinks of what our day to day relationship will be before hitting the trail. Some people may differ in their opinions of this, but I will tell you right now that this was a wonderful idea. Jen and I have had a few misunderstandings and it has been a luxury to be able to come back to the apartment and have separate rooms in which to be alone or to think things through. These are luxuries we will not have on the trail. Our time together is spent in some of the most uncomfortable situations. We eat together, train together, sometimes we work together. We need to learn how to deal with all of the unfortunate feelings and situations that arise when two people spend this much time together. We need to be able to deal with each others bad moods and know just what we can say before we cross the line. We need to be comfortable enough with each other to say “i just need silence right now” or “i am so sorry…but I can’t reach this tick”. Gross, maybe a little. True, definitely. 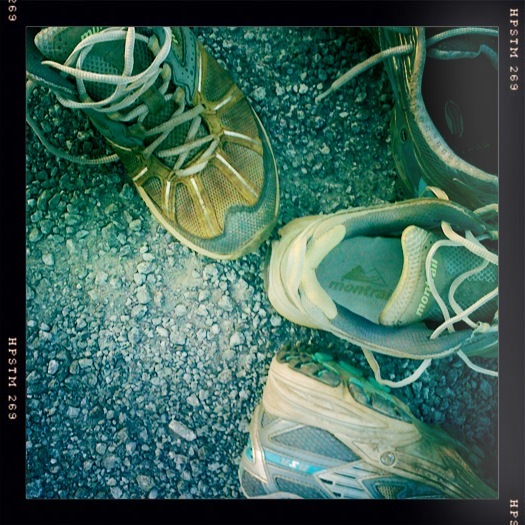 Logging 25+ miles a day on the trail together will take its toll both mentally and physically. We as humans are not mind readers, so we need to be able to tell each other exactly what we need. We also need need to know that when we say what we are feeling that it will be received in the manner that it was meant without needing an in depth explanation. When you are physically exhausted and hungry you simply lack the ability to construct complicated and elegant thoughts. I feel that Jen and I turned a corner approximately 3 weeks ago. We had a conversation with our coach and in that conversation we explained to her that she needed to start viewing us as a team. She needed to forget the concept of us as individuals and look at us as the same person. I can only imagine that it must be difficult from a coaching standpoint, but in all actuality we are only as strong as our combined weaknesses. We train together. If I have a bad day, Jen has a bad day. It is unfortunate but it is true. In the end, we will run this thing together. Step by step by step. Physical preparation is a huge part of our lives right now. However, when we were doing our research we had a really tough time finding information on how other people trained for their thru-hikes or thru-runs. Lots of folks on traditional thru-hikes let the trail get them in shape. They start hiking 8-10 miles a day for a few weeks until they build up the stamina they need. They usually start in the south and go north because the trail gets progressively harder and therefore allows for this kind of “on the job” training. With our plan for the trail this doesn’t work for us for a few reasons. One, we want to be trail running as much as possible from the start. Two, we are going north to south, therefore starting on the hardest terrain and ending on the easier sections. Finally, we don’t have six months to complete the trail- we are shooting for four, which ups the necessary daily mileage by quite a bit. All of these factors lead to the fact that we have to whip our butts into shape pre-trail! Welcome to our blog, thrutrailchicks.com! We are Emily (also known as Koala) and Jen (also known as Panda), two trail runners and hikers who are planning, prepping and eventually fast-packing the Appalachian Trail this summer. For those who aren’t familiar with “fast-packing”, it is a combination of trail running and hiking while carrying very light weight supplies that allow you to be self-sufficient on the trail. Our plan is to fast-pack Southbound- start in Maine at the end of June and end up in Georgia by sometime in October. We will be accompanied by our four legged life partners, Georgy and Chille. The main goal of this blog is to allow our friends and family to follow along with us on our adventures. In addition, we hope to help others planning similar adventures by filling in some of the holes we found while doing our own research. What we have planned isn’t your typical thru-hike- our goal is to be trail running as much as we can, but without the advantage of a support team. We will be carrying our own tents, sleeping bags, food, etc. which is a challenge itself. Plus, bringing dogs on a long distance hike has its own set of advantages and complications which we plan to enumerate in the course of planning and executing our AT fast-pack. Over the next few months you can expect lots of details on gear, food, planning and physical preparation. We have an amazing coach, Wendy Mader, who works with us to create a week-by-week training plan to whip our butts in shape enough to hit the trail running. Literally. We work out 6-7 days a week stair climbing, running, cycling, swimming and then running some more to build up the type of stamina we will need on the trail. (We also throw in the old ab routine as well as burpees and lunges/squats. Ugh!) We are both based in Tucson, Arizona at this time, so don’t be confused by the desert foliage in all our training pictures! Thanks for visiting our site and check back soon!